So here’s something that I know people do but never really hear people talk about: upgrading engagement rings. If you’re married, engaged, or just fond of thinking about rings: when, if ever, can one “upgrade” an engagement or wedding ring to get a larger diamond, adding more stones like baguettes or upgrading the setting to something like a Halo? When, if ever, can one replace a wedding ring for fashion/style reasons? (Obviously, the easy answer is “whenever the heck you want,” but there’s an etiquette issue here with your partner, as well as budgetary issues, fashion/lifestyle issues, and more.) 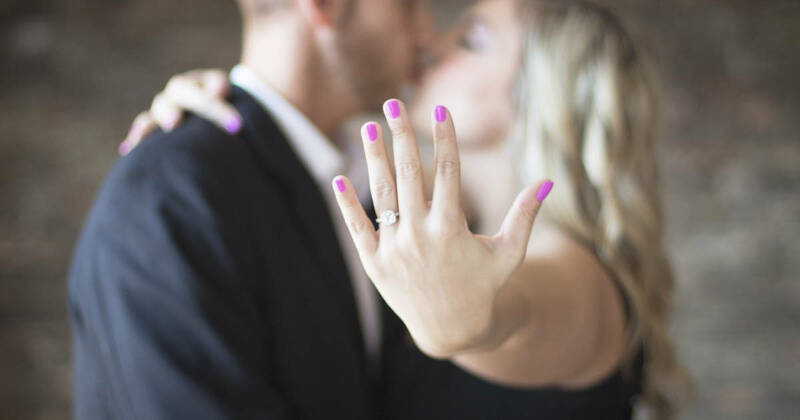 We’ve talked about whether you have to take a diamond ring off to interview — but we’ve never talked about an engagement ring upgrade or anything else from this angle. Still other women wear multiple engagement/wedding rings. There are two ways I’ve seen this play out. One girlfriend of mine inherited both her mother’s and grandmother’s rings, so in addition to her own wedding rings she wore six rings on a regular basis. (It was extra in the best way!) 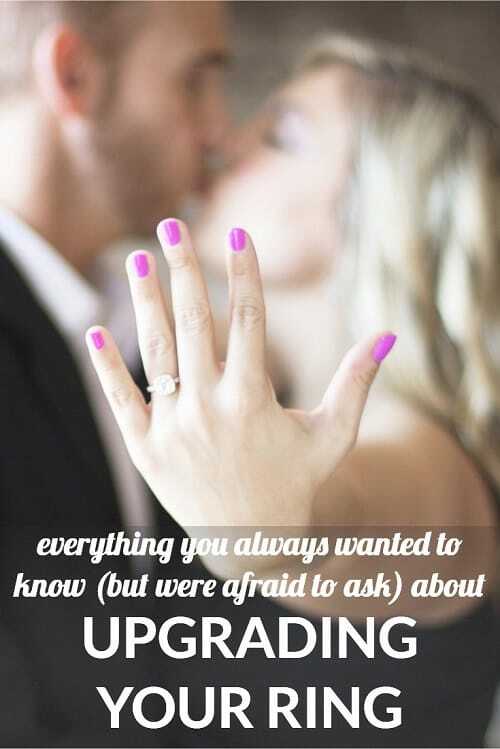 The OTHER way I’ve seen it (well, read about it) is featured in this old post from You Look Fab where Angie describes swapping out her wedding rings like fashion accessories. (On a much smaller level, I suppose I’ve also seen this with women who have “traveling” rings, usually a very simple band they wear in place of their $$$ diamonds when they travel, particularly to foreign countries.) When I first read the You Look Fab post years ago, it really appealed to me — and I could see myself doing it, if I found the right rings — but I’ve been married for almost nine years now and a) I never take my rings off, and b) I never shop for diamond rings because, well, why would I? Still, it’s an intriguing idea to me. So let’s dish, ladies — is your ring your partner proposed with your “forever” ring? If it wasn’t, have you upgraded or downgraded it? Did you ever felt like you “outgrew” your diamond ring in terms of fashion/style, lifestyle, or with physical changes (e.g., arthritis, weight change, etc?) Would you ever consider swapping out an engagement ring for fashion reasons? Psst: We’ve also talked about how to deal when your boss makes rude comments about your engagement ring, wearing engagement rings at work (and how much jewelry to wear to work), and fine jewelry vs. fashion jewelry at the office. All! How many have you had?? ;) Who’s your favorite tattoo artist? My 2018 goal is to get inked and I think we might live in the same town. I think she meant “all in” as in the total cost, rather than “all of my million rings together”…unless there is some key info that I have missed in RH’s various posts. I attempted to indicate by the wink that I was joking. Also I just re-read and saw that she typed “All IN” now I feel kind of tacky. Sorry! Oops, I totally missed your wink. Uh, the person who I’m eyeing is Evie Yapelli, of ShowPigeon. Specifically, I want one of her hand shadow puppet things. Also eyeing some of the folk at Mule Tattoo in Tustin, down the line. Oh wow you’re in Cali! Samsonite I was way off! I’m all heart eyes over Evie’s work though. Getting my first ink in SD next month. Unfortunately I live in TX so I have to find an artist here for my more detailed pieces. Thanks for your response though! ha, kk, i lived in Chicago for a very formative few years, so you’re not wrong! My ring was bought when my husband and I were both in graduate and barely making it (so smaller diamond and at some point the band bent a bit) but I would never swap it out even though we can afford something nicer now. It’s part of our history. Me too. My ring is nice enough (slightly less than a carat emerald cut with side baguettes) but not super showy. Our 15th anniversary is this year and I am planning to buy a fancy ring for my right hand with more “wow” factor (I love blingy jewellery) but I would *never* want to change or upgrade my original rings. They remind me of that really special time and how far we have come together. I got engaged when I was unemployed and my husband was in grad school and neither of us feel that going into debt to buy a ring is responsible, so my ring is very small and modest. I can’t get imagine upgrading it – I still think it’s beautiful and it just seems painful to me to transform it into something that looks totally different. We’re much better off financially now and I’ve let my husband know I wouldn’t be opposed to jewelry, including diamond right-hand rings, for milestone anniversaries. But I would never officially upgrade the original ring and can’t imagine I’ll ever stop wearing it. Tangent, but what do people think about swapping out for the silicone wedding bands? I see this often with Crossfitters, but I don’t understand the appeal of having a “workout” wedding band when you can just not wear one. Do any rettes do this? My fiancé and I are rock climbers, and we’ve both been wearing silicone bands on our right hands as engagement rings for the last two months while we wait for the rings we designed with a jeweler to be made. I don’t take the silicone one off to climb – it’s really comfortable. I expect I will wear the silicone ring hiking, mountain climbing, scuba diving, etc. (all day stuff), although for an hour of climbing after work, I’ll probably just take off the metal ring and not wear a ring. My brother and SIL bother use the silicone bands. They get massive flack from everyday strangers for them but personally like them. I’m a “don’t wear one” type. I got out of the habit when I was in martial arts. My husband has been talking about tattooed ones recently- but every couple I know who’s had the tattooed bands broke up soon afterwards. I’ve always just removed my rings for workouts, but I’m staring to think of buying a silicone ring, not to wear in replace of, but over top of my ring when I’m at the gym (I only wear one). I’d feel better leaving it on than sticking it in a locker when I go straight from work, and I think the silicone could protect it from dings / alleviate pressure of the (ring) metal on (weights) metal. I wear weightlifting gloves at the gym when I’m working out with weights, and I find they make me more comfortable working out while wearing my ring. For cardio, I just leave it on as normal. For yoga, I usually just take it off entirely, but keep it in my bag which is in the room with me. For hiking, I’ll often leave it at home. Sometimes for travel I’ll leave the ring at home and wear a cheap ring in it’s place – otherwise I’ll have several moments where I jump going “oooh-where-is-my-ring-oh-noooo…. wait, it’s at home.” Having a ring on, even if I know it’s not my real ring, means I never have that moment of panic when I realize it’s missing. I imagine the silicone rings would do the same thing. I just wear my Qalo ring all the time. I don’t even work out. 2 kids and I’m always washing my hands and taking my ring on and off. I don’t worry about accidentally leaving it somewhere. My hands swell in the summer so much that I really prefer the Qalo to metal. I have rarely worn my metal rings in the 2 years I’ve had the Qalo. My husband’s grandfather lost his ring finger in a farm equipment accident, because of the ring, so our compromise is that he wears a Qalo-style silicone band most of the time. His real ring is also solid black, so unless you’re really playing attention, they don’t look that different. I’ve had just enough skeezey coworkers who didn’t wear rings or would take them off during travel that I wouldn’t have felt good about him never wearing one, even with the family memory of safety issues. My grandmother lost her center stone on a vacation when I was a baby (after my grandfather had passed) – she was devastated. I don’t have a silicone ring but I do have a fake engagement ring. I was too scared to bring my engagement ring on a vacay when I was newly engaged (probably both because of my grandmother’s story and also it was so new and expensive), and at the gift shop at the resort we saw a fake engagement ring, that was honestly pretty nice, for about 60 bucks and so my now-hubby bought it for me. I tend to wear the fake one on vacations and just the real at home. For working out, it’s either no ring or just my wedding band if I’m not doing anything with my hands. While I’m no longer scared of wearing my engagement ring, the fake one still gives me a little piece of mind – less to worry about on vacations if I’m scuba diving, or at the beach, etc.. I just leave my band off when I work out, but I do like the look of the silicone bands I’ve seen people wear. For some women (unfortunately), wearing a band while you work out might prevent those guys who just love to try to chat you up at the gym. Plus, for people who are fitness instructors (or even if they just have a job/hobby that includes a lot of physical labor that could damage a ring), it might make more sense to have a “work” band so you’re still wearing a wedding band most of the time. I like my engagement ring but had wanted a eternity band for my wedding ring. Due to how expensive it was and not wanting debt, I got a simple band with no stones instead, thinking that at my 10th anniversary, I would upgrade to the eternity band I wanted. A few months after I got married, I lost the wedding ring at work (fell off my finger somehow). I replaced it with another simple band. I don’t wear my wedding or engagement rings except for special occasions since I’m always afraid of losing them. When my 10th anniversary came, even though we could afford it, I decided not to upgrade since I don’t wear my wedding ring regularly. My husband also lost his wedding ring at work and ended up replacing it with a $20 ring that he bought online. He no longer wears his wedding ring either. My husband bought an engagement ring that was expensive for us back then (4x-5x his monthly salary) but with the idea that I’d only have one in my lifetime-so he wanted to make sure I’d always love it. We did pay it off over the next two years, which I didn’t mind. I am not planning to upgrade but I also haven’t been married for decades. A relative got engaged very young and has an engagement ring that she would like to upgrade, however her husband is upset at the idea-it has sentimental value-so that hasn’t’ happened. I think engagement rings are a very personal item- some like them large and expensive, others couldn’t care less. My ring belonged to my fiance’s great-grandmother. It is beautiful and is the style I would have chosen even if we had purchased from a jeweler. We obviously have no plans to switch out a family heirloom for anything different. I don’t plan to add a band – the filigree-style setting is rather wide by itself. +1, fiance’s great-grandmother’s ring. I did not want an engagement ring if we had to buy it so the only reason I have one at all is that this ring (and others) were left to my husband/first cousins for proposing. It is classic and simple (I am “fussy unadorned” so this is ideal for me) it did not need to be sized, and their marriage was a love match in a time and place where that sort of thing was unusual, not totally approved of, and they had wonderful lives together. I wouldn’t change it for the world and we tell each other that it will bring the happiness of their marriage to ours. Hooray for family heirlooms! Mine belonged to my husband’s grandmother. They were very close. It’s not a style I would have chosen initially but that makes me love it more because it’s unique and meaningful. Also, I appreciated that we didn’t buy new because of the cost/ethics of diamond mining. I chose my band, very thin with channel set diamonds (the guy in the jewelry store told me I couldn’t buy it because it didn’t match the setting of my engagement ring… what??? I bought it anyway) which made me feel like I was customizing my engagement ring to my style and our story. I typically don’t wear my set when working out and only wear my band when I’m traveling. There used to be a shop in NYC that specialized in travel jewelry but it was very blingy stuff that was fake so I guess you could still have your diamonds and whatnot, but if you lost anything/had it stolen, it wasn’t as big of a deal. I remember thinking it was pretty pricey for what it was but it looked great. More on topic, most people I know wear their engagement rings less the further along they get into their marriage except that some older women who never wore an engagement ring at all/for long to begin with, “upgrade” to a big one, usually with a matching new band, often in connection with some anniversary or another. I had a boyfriend once whose mom decided to upgrade her engagement ring. She wound up getting a super trendy white gold halo engagement ring that always looked so wrong to me on her (older) fingers with her intricately detailed yellow gold wedding band. Has anyone ever sold an engagement ring? My divorce is final, and I’m looking to sell mine. It isn’t significant, but I have no reason to keep it. I’m considering either one of the online ones (like idonowidont dot com) or a jewelry store in NYC. Any advice? How do I figure out a fair price? I have the appraisal from 12 years ago. I sold mine to a jewelry store. It was Tiffany, and I actually still had the blue box and the interior velvet box and even the white ribbon thingy, as well as the authenticity certificate, which helped with resale value. The appraisal might be useful, but honestly, I just took what they offered from a pricing perspective. I didn’t care, so any money was a bonus. I’m sure you know this, but the depreciation factor is massive – I think the set was $4500 total and I got like $900 for all of it. I didn’t sell mine, but I did repurpose the stones into jewelry. I had a three-stone ring – the center stone is now a pendant I wear frequently, and I had the side stones set into a new ring with a blue topaz center stone (my birthstone). I love it and wear it on my right hand almost every day. I don’t know if this is something you would consider, but I looked into the resale market and I wouldn’t get nearly as much as it was worth. To be fair, my divorce was final 8 years ago, so I had no attachment to the ring/stones at this point, but it might be something to consider. After my divorce I sold mine to a local jewelry store in town. A friend who had sold hers recommended them. I had the appraisal from 2004. The jeweler looked at it and compared it to the diamond. Then he showed me the jeweler’s app he would use to calculate a price. Before going in I had read that I would be lucky to receive 40% of the appraisal value, and that’s exactly what I got. The jeweler was very upfront and transparent through the whole process, and I felt very confident and comfortable that I received a fair price. I sold mine on Craigslist a few years after my divorce. I still had the appraisal paperwork. I got about 25% of what my ex paid for it, and I was pretty happy about it. We’re in our mid-30s. My fiance used an inherited family diamond (2c) and then used the budget we had discussed him spending on an engagement ring (an amount we both thought was reasonable) on upgrading the band to platinum and adding some side stones in my birthstone (emerald). Because of the inherited stone, it’s much fancier/appraised for more expensive than we would have planned. However, again because it’s a family stone, we’ve discussed possibly giving it to one of our potential future children to use as an engagement stone later on, at which point we might just buy me a new diamond to replace it. But that’s not due to an “upgrade” issue, just a preserving/passing on the family stone issue. Personally I would want to keep it as is, but I understand wanting to give it to our children as well. Dad is holding Grandma Leyeh’s engagement ring for me (Rosa did not want anything less than 3 CARROTS), but I have NOT found a guy willing to marry me, even though he will NOT have to buy me an engagement ring. Grandma Leyeh looks at me like I conned her into giveing me $50K — she gave it to me to help me get a guy to marry me, but I have NO takers. Grandma Trudy says it is b/c I am to pretty and to smart for most men, and the ones that would have me are already MARRIED! FOOEY! I realllly want emeralds in my ring but I’ve been scared off reading about how they’re apparently not as hard and durable. A jeweler that we went to while looking for wedding bands said that women who get them in wedding bands complain of cracked emeralds. Mine in my engagement ring were very important to my fiance to include, and they make for a very dramatic look. They are actually oval shaped (not emerald-cut emeralds) and are bezel set (kind of like channel set) so they are secure and I can’t imagine how they would be knocked about and broken. But I do have to take care to clean the ring differently than you would a diamond solitare ring. I’ve only had it for about 10 months, but so far so good, no issues. That is why I got a greenish sapphire, which I am super-happy with. Chiming in late, but my wedding ring is an emerald & I’m not super happy with it – the stones don’t feel as hard/look a little worn somehow (hard to describe) that I don’t wear it very often as a result (I have anniversary bands that I stack and wear every day). We got married fast, the emerald ring was actually a cheaper way to go at the time (we had a ton of expenses then & didn’t want to spend a bunch on a ring). My dream ring is an antique deco style, which we’ve talked about getting me for our 5th anniversary. I’ve had my emerald ring for almost a year? Wearing it every day, super clumsy, no issues so far. Just get it appraised and insured. I love it. My husband’s godmother had saved several diamond rings she inherited from her godmother for him to give away someday. He actually proposed with a different ring but told me I could see the others when I got home. I ended up with his great-godmother’s vintage 1940’s wedding set; as soon as I saw it, I knew it was mine. I don’t foresee myself changing out the wedding set or adding to it in the future since it’s already complete. I did buy a more casual silver ring that I sometimes wear when my set gets to be too big in the summer, and I have a silicone Qalo band that I bought for backpacking and foreign travel. I always come back to my gorgeous diamond rings though! I have a just under 1 carat solitaire engagement ring and a 1.33 carat 5 diamond wedding band. I am undecided if I will update the engagement diamond or just buy another 5 diamond band / a blingy full set for a future anniversary present. I love jewelry generally and can definitely see myself upgrading as time goes on. My husband-to-be knows how much I love jewelry and shopping for it, so we had a ring-less proposal and then I went on the hunt for an engagement ring afterwards. I love the ring I chose, but it is an unusual shape – no band sits right with it. So when we chose a band, I moved the engagement ring to my right hand. But – I swap things up all the time. Over the course of anniversaries and birthdays, he has bought me/I’ve bought myself about half a dozen other rings that I wear stacked up with, or sometimes instead of, my engagement and wedding bands. They aren’t upgrades per se, but I just love jewelry too much to wear the same two rings all the time. I actually DOWNGRADED my ring. My husband proposed with a perfectly lovely solitaire, which I still wear every now and then with my coordinating pave diamond wedding band. None of this was crazy fancy – the stone itself is around 0.75 carat, and we paid maybe $350 for the wedding band. Still nice and I’m very sentimental about it! A couple of years after we got married, though, I was traveling solo overseas for work and didn’t feel comfortable flashing even a modest amount of bling. I bought a plain comfort-fit white gold ring that matches my husband’s wedding band and have been wearing it day-to-day ever since. It doesn’t get caught in my hair, doesn’t get knocked around, and I find it goes better with my overall aesthetic. And – I like how relatively unusual it is (at least in my corner of the US) NOT to wear a wedding ring with a stone. Amen. I never had an engagement ring and never wanted one–I am against the idea as a matter of principle. I was genuinely shocked how much flack I have taken for it over the years (and I do not advertise or really discuss the reasons I don’t want one, so it’s not a reaction to my views, it’s a reaction to the pure fact that I wear a plain wedding band). Many people don’t even think I’m married unless I mention it. My “engagement ring” is my “fakegagement ring” because, for a while before we had any concrete plans to get married, it made sense for my now-husband and i to present ourselves as something more serious than bf/gf might sound. So I had him buy me this cool sterling silver ring off etsy that is almost a cheeky spoof on a diamond engagement ring (it was a birthday present) and then after we got married (with sterling silver bands) I started wearing the fakegagement ring with my wedding ring, because why not? Thank goodness no one has given me a particularly hard time about it, though I’m sure people do judge me. Eh! I would never in a million years be okay with going into debt for an engagement ring. My current engagement ring is a stone that belonged to my husband’s late wife, which is fine with me. We had it re-set and I love it. I wear it on my right hand since the wedding because we have matching very-wide wedding bands. My second husband was super broke and actually proposed with a CZ, which I will admit I was not super crazy about. We upgraded to a 2 ct equivalent moissanite, which I loved. Yeah, borrowing for a ring sounds nuts to me. Related: recs for where to shop for engagement rings online? Or opinions on whether that’s a good idea? I got my engagement and wedding rings from a local jeweler, but after I lost my wedding ring, I found a very similar one (maybe even the same one) on Blue Nile for much less the local jeweler. My husband got my engagement ring through an online retailer and I love it! He used BlueNile and said it was a great experience. We visited stores in person before to look at my preferences and for some odd reason my ring size varied store to store (my fingers also swell super easily). I ended up having to get it resized after he proposed, but I loved it. Ended up getting my wedding band locally at a family owned store. Mine was custom made by a local jeweler due to the inherited stone. Pricey and very slow. But for wedding rings for both of us, we looked at Gemvara, Blue Nile, Brilliant Earth, and Angara. We ended up each separately purchasing from Angara because it had the right aspects of our very different wedding rings (mine platinum with 7 princess channel-set diamonds, his yellow gold domed comfort fit). We had also previously purchased other jewelry from Angara, had done lots of research, had good results, and thus highly recommend it (sapphire earrings, amethyst earrings, garnet pendant, etc.). My opinion is not a good idea, not because I think it’s sketchy, but because I think engagement rings look very different in online pictures than they do in person because the pictures are generally magnified. When we were looking, I was considering several options at Brilliant Earth (I wanted vintage). I happened to be in a town where they had a showroom for work and stopped by to see several in person, and it really makes a difference. I ended up finding my setting at a local jeweler; I later found the ring on the designer’s website and I would have never picked it just from the online picture because it looks very different. I do think it’s doable if you know you want something simple, like just a solitaire. But even then, I would look in stores first to get a sense of what size diamond you want. My engagement ring is from James Allen – I love it, and my husband was really happy with their customer service. Do you live in a city that has a jeweler’s row/diamond district or do you ever travel to a city that has one? If you don’t live in a city that has one, next time you are in NYC, Chicago, etc. go visit and you will see how much more bang for your buck you will get. My husband’s family is in the business – a local jeweler (that designs and makes the jewelry instead of a retail one) is going to be better quality for a better price than a retail jeweler or an online one. Costco has great diamonds at good prices. My wedding band is from there. I got the ring that was right for me. I try not to judge other people’s choices. Ding, ding, ding. This is the right answer! I’ll bite. My engagement ring is a simple high-set 2.5c platinum solitaire, and my wedding band is an eternity band with not-small stones all the way around. When I wear them together, it’s A LOT. Like, random people comment on it. I’m not otherwise flashy, so I sometimes just wear my wedding ring, especially when traveling abroad. I wear a silicone one for working out sometimes – that’s more because I can’t get a good grip and I dont want to damage my rings with dumbells or barbells. I know people see my rings, and I know people make assumptions about me. I dont always love that- but I’m not going to change anything about my rings either- these represent really, really happy days in our long, happy love story. I could have written this post. I have a 3 carat diamond on a very thin eternity band and it’s a lot of ring (it’s honestly more ring than I probably would have picked on my own, but my husband is so proud of it and it represents some very happy and meaningful memories for both of us). I don’t like that it causes people to make (often incorrect) assumptions about me, and I get uncomfortable when I overhear people talking about it in public. I don’t mind when strangers compliment it or ask me about it (though it’s always awkward when people ask the size of the stone). Your ring can be too big. Mine is. 2 ct ring + smaller side stones. I wear a $20 QALO ring every day. And I still have to pay for a jewelry rider. My SO proposed without a ring, because I had inherited a family stone from my side, and it would’ve been a little weird to propose with my own ring. I designed the resultant ring as my “forever” ring, though, since the stone is quite nice, and a fancy ring without the expense of the center stone costs less than a less fancy ring with the center stone. I wouldn’t go into debt to pay for a ring, though. I’d rather get a cheap ring for now and save up for a forever ring. My ring was modest (just over 1/2 a carat) and we chose two diamond bands that we had soldered. The diamond is very high and constantly catches on everything so I didn’t wear it anywhere besides work. I inherited my Great Great Grandmother’s wedding ring, which is a plain gold band that she and her husband got from a pawn shop that has some random person’s initials engraved on the inside, so I wear that all the time and only wear by engagement and wedding rings on special occasions. My engagement ring was $100 at a pawn shop. We also both have wider 10k comfort fit bands. that were less than $100 each. My engagement ring is a band with small channel set diamonds and my wedding ring is a plain band. I never take them off but I’ve always thought that something with more height would be more flattering with my finger shape, so for our 15th anniversary this year I’m getting an amethyst solitaire to add to the stack. Amethyst is the birthstone for both of our kids, and I like the idea of having everyone in our family represented in the jewelry that I wear every day. Awww, thanks! I’m really excited! I really love the idea of stacked bands rather than a solitaire and a band. I did not want a diamond engagement ring and have an unusual wedding ring. Our rings were made by a family friend of my husband’s family. My ring has an asymmetrical blue-green sapphire that sits above swirly, open gold wire between two small bands. My husband’s ring is silver with the swirly gold wire on top. Almost 25 years later I am still very happy with our rings. To answer the actual question I do have a spare simple band from Kmart I wear when traveling. If I am going to the gym or running a race I don’t usually wear either. I have about 1 carat (just under, we gamed the pricing so it looks the same but was cheaper) with rubies on the side and a curved wedding band with 5 smaller diamonds that sits under it. We got a matching band on our 10th so now I have diamond bands on either side. :) I wouldn’t upgrade, it would be too big and I don’t like the rings where the diamond sits high and catches on everything. I got married with temporary rings because there were problems with the setting that the jeweler couldn’t fix in time for our vows, so they lent me a plain band and then reset both rings after our wedding. So the horse has already left the barn in terms of wearing my “original” ring. A few years later, we’re on our third round of issues with the setting coming loose, and I’m strongly considering getting everything reset with a new jeweler. I love my ring but hate the idea of having to go get the setting fixed every couple of years. And we’re no longer local to the original jeweler so we’re paying a new jeweler every time to fix a ring that wasn’t their original design. Ugh. Aside from that headache though, I have no desire to change my ring. My husband saved for it over several years when we were pretty young, chose a ring that was perfectly my style, and a good friend went with him secretly to pick the actual diamond. On the other hand, my MIL recently upgraded her setting and it was the right choice for them– for some reason her original ring couldn’t be resized so she hadn’t worn it in a long time, and she was able to add a halo and some other stuff she wanted after 30 years of marriage. My choices for me, and your choices for you, it’s all good. I have a smaller ring and wedding band. We could afford more (and could have then as well), but I’m not a flashy jewelry person. And that aside, the one that he picked out by himself is special in a way that something flashy could never replace. On a regular workday, I wear only one ring on my left hand. It’s a delicate gold band with some detailing and a few tiny diamonds set into the band. I swap it out for a couple other fancier rings on occasion like when going to a gala or when I’m just feeling in the mood for bling. The other fancier rings are rings that I’ve bought for myself over the years and that I often wear on my right hand as well. So I guess my “upgrading” has been buying myself a couple fancy rings as I’ve run across them and felt like “I must have this.” I don’t like wearing anything around that costs more than $500 though. Too much stress for me. I also have really particular taste in jewelry, so I like choosing and buying my own. My original engagement band is a wide band – one solitaire with two small channel-set diamonds on each side. Since it was a wider band to start with, I decided to forgo the wedding band altogether. On our 10th anniversary, we added a narrow band and had the two pieces soldered together. The narrow band also has tiny channel-set stones in it. It looks perfect together, like it was always meant to be. While the new band is technically an upgrade, that wasn’t the intent behind it. It was all about honoring our past, plus our journey as a married couple. I don’t wear much jewelry on my wrists/fingers, so it feels extra-special. My husband and I were both married before. We bought my diamond wedding ring at a antique shop in Montreal for under a thousand dollars and my husband actually wears his platinum wedding band from his first marriage. I had it polished and engraved – he loves the ring and, honestly, I was offended by the idea. I like jewelry so I’ve considered having a small collection of fine rings I can wear on my left ring finger. Editing to say that I was NOT offended by my husband reusing his wedding band! On a related vein, how long did it take for you to get back into your wedding band(s) post partum? I’m at 6 weeks and they can’t quite get over my last knuckle. All my size 7 rings fit just fine; my wedding bands though were a 6.5 and seemed to have fit perfectly (no turning around when I’d flop my hands) prior to somewhere in my second trimester. I’m wearing one of my cocktail rings in the meantime but really want back into my wedding set! I never got back to the same size. I finally got my wedding ring resized when my youngest was 5. It’s a bit of a blur, but it was around the time I stopped having nightsweats. Honestly, I couldn’t tell you now if it was two weeks or six weeks that I was sleeping on towels, but by the time that was done, my rings fit again (unlike my shoes, which never did). I am so glad i am not the only one who did not get a BLING! We got married starting off of our career so it was too much to spend on a ring. I got very simple anniversary ring. Later my father in law gave me an antique sapphire ring from his mother so i am wearing this together. I do get lots of compliments. Now married for nearly 20 years, i want to have some decent rings to put on the right fingers. (I am in sales and i do not want to be too flashy with that however… ) My customers are having so much bling that i have to wear sunglasses to meet them. I guess being wise is a great start of marriage. I know so many people who are still paying for the ring and wedding after the divorce. *Upgrader here. We got engaged while studying for the bar. We bought a ring (cash) shortly after we started our jobs. 10 year anniversary –I got the ring of my dreams (cash). I wear my eternity band every day. I swap out which “engagement” ring I wear. I’d never get rid of my original engagement ring. Why do we continue this tradition where we expect men to pick out this important piece of jewelery for women who have to wear it for the rest of their lives? I didn’t like the ring my DH proposed to me with, but five years later I am still wearing it because he was offended at the thought of me exchanging it. Will probably swap it out for a simple band once we have kids. I’m so picky, I even designed mine. I’m romantic in a practical way, and SO knowing that I’m so particular about jewelry that he shouldn’t even try to pick out a ring was really romantic for me. Ha, one of the reasons I was opposed to being proposed to! Don’t *surprise* me with the most expensive jewelry I’ll ever own and/or with the request to spend the rest of my life with you! Let’s talk about this stuff! I haven’t worn my engagement ring on a regular basis since I got married. Sometimes people do ask where it is or if I have one, but that’s rare. If they do, I just shrug and say I’m wearing the important one. I told my boyfriend that he didn’t have to get me a ring at all (he was working retail) and also that if he proposed with a blood diamond I would say no. He got me a claddagh ring with a blue topaz in the heart, which I love. It’s on the bulkier side so as a wedding ring I just wear it turned in instead of adding another band. It cost $500 (which I thought was a lot but he didn’t consult me, lol). I got his wedding ring online for a sweet $90. Also have a claddagh. I think it’s nicer not to wear it with a separate band! Instead of two rings, I opted for a band with inset diamonds (it’s one of the Tiffany celebration rings) for both. We celebrated our engagement with it. Then, a few hours before our wedding, I took it off, handed it back, and we celebrated our marriage with it too. Suits my lifestyle, but everyone is different! From someone who has worn my ring for 29 years…. please be careful to check your prongs… especially if you have a 4 prong setting. Stop and check right now. I lost my center stone several years ago. Now I routinely check my setting. Crazy.. the day I lost it, I actually prayed I would find it. We searched everywhere, the office, the car, we vacuumed the house and then went through the bag looking for it. About six months later I was changing purses and found the stone floating in the bottom of my purse. Answered prayer. I have several friends that tell similar stories. I also have a six prong setting now just to be safe. My now-husband had ONE input for my engagement and wedding ring (other than budget) and it was for me to get 6 prongs instead of 4. He had read ONE online comment that 6 prongs would be more secure and that was his one “ask”. My husband proposed with his grandmother’s ring. It was a beautiful ring but not my style at all, plus there was no way I could add a band to it. He told me from the beginning that it didn’t need to be my permanent ring, though. I did wear it for a while (we had a long engagement) and then we went shopping together for an engagement ring and band. We got a smaller stone that fit into our budget at the time, but we have also talked about upgrading my rings at some point in time, probably for a big anniversary. I love the rings I have now and they will always have sentimental value to me, but I love the idea of celebrating a milestone anniversary with something new. And not sure if it matters, but my husband actually had to temporarily change his wedding band. He injured his left hand pretty badly and his knuckles swelled. So we got him a new (different style) band in a larger size to wear until the swelling went down, which took almost a year! Now I’m blanking on what the metal was in his new band, but he loved it and said he eventually wanted to replace his gold band with that metal sometime. My husband and I are on our fourth set of wedding rings. We have been married almost 20 years and have changed rings about every 5 years. – Set 1: the one we started with, very traditional and not really “us.” They had the advantage of being cheap when we had no money, but I knew we wouldn’t keep them forever. Maybe $200 for both rings. – Set 4, current set. I asked for new wedding ring for my birthday last year and sent him some links to handmade rings on Etsy. He chose my absolute favorite ones, they’re beautiful and I just love them. He spent $500 for both. We’re already talking about what we’re going to get for our 25th anniversary – he wants to get something more expensive. As for my engagement ring – this is terrible, but it was a family heirloom from his side of the family, and I lost it in our house. I still have dreams where I find it, but it’s been gone for over 10 years and I turned the house upside down every few weeks for a year trying to find it, and it’s never turned up. My husband thinks we’ll find it when we move, but I’m sure that it’s long gone. I got engaged when young and we chose a very pretty ring, but that engagement didn’t work out. When I got married later in life I chose (like my mom) to have just a plain wedding band and no engagement ring. For practical as well as financial purposes that works best for me, especially as I’m a bit forgetful and clumsy so it would probably have taken a lot of knocks and/or got lost. But while I prefer not to have one myself I enjoy seeing lovely rings on other people. I meant to add, the wedding band itself is extremely plain and simple (we got a matching pair) and is looking a little dull and scuffed but I wouldn’t swap it out. We might get them polished up for our 10th anniversary though!